This Gregory Zulu 55 pack review is about the new 2019 version of this backpack which is now with an adjustable torso size and it is better than ever. So please keep reading. Pivot and flex hip belt design. All the Zulu packs from this 2019 series are now available on Amazon. I have checked and can confirm that this pack is on several of their regional stores. So follow the link and you might find it in your local Amazon store and save on shipping. The Zulu series has been reshaped recently and the list of the most important changes I have presented in my recent text. So if you are not familiar with these packs, this is a famous series by Gregory which includes several packs, this 55 liters pack is the second largest after the Zulu 65 pack. These two packs share basically the same features but the other smaller packs in the series are very different. You can read about them in my separate texts, so check these Zulu 40 and Zulu 30 backpacks. The Zulu 55 is a top loading pack with a floating and adjustable lid, but it also has an inverted-U shaped large zippered front entrance, it is visible in one of the pictures below. In addition to this, you also have a separate bottom compartment with a removable divider, so this is the third entrance mentioned in the key features above. The pack is hydration compatible and you have a fixed internal sleeve for a 3-liter reservoir. I stress that it is fixed because in the previous version it is removable and serves as a daypack. Note that they also build the corresponding women-specific series under the name Gregory Jade with the same number of packs in the series but each smaller by 2 liters. You will see some of them below. This is the best part of the pack. So as mentioned above, you have an adjustable torso size. The system is based on Velcro hook and loop connections, so just break the connection and move the shoulder harness up or down and press to engage it again. This allows for several people of different body size to use the pack. The back panel is a tensioned mesh visible in the picture above, so you have excellent ventilation in all directions. The tension is created by a peripheral steel 4 mm frame, and all is supported also by a fiberglass anti-barreling stay and HDPE. The lumbar zone is with cut-out sections covered with the same mesh which continues to the hip belt. The padding on the hip belt does not look as massive as it was in the previous version (which is still on the market so do not get confused). Note that you have what they call the Free Float system which allows the hip belt to pivot and flex with the movements of your body. The shoulder straps are with excellent padding, and you also have load lifters, adjustable sternum strap, and an emergency whistle. Some of the features – side pockets, pole attachment, and the rain cover. This pack has 7 pockets. You also have 2 pockets in the lid, one with an external zippered access and one zippered underneath the lid where the rain cover is stored. There are two zippered pockets on the hip belt (see one below) and two stretch mesh pockets on the side (one visible in the picture above). Note that they are with inside-out design for the corresponding compression straps, for uninhibited use of the side mesh pocket. One large stretch mesh pocket is on the front, and it is secured with a top buckle. More features – attachment system for glasses, zippered large hip belt pockets, and the large zippered front access. You have the full set here. Dual compression straps are on each side, and you also have dual attachment straps on the bottom. There are 4 loops on the lid, and you have dual loops on the bottom for the poles attachment, paired with bungee tie-offs. Yet another useful feature is the QuickStow system for glasses attachment on the left shoulder strap, it is visible in the picture above. Two sizes: S/M and M/L. Weight (M/L): 3.66 lb (1.66 kg). – S/M: 3234 in³ (53 l). – M/L: 3356 in³ (55 l). Dimensions (M/L): 27.5 x 15.7 x 9.8 in (70 x 40 x 25 cm). – S/M: 15 – 19 in (38 – 48 cm). – M/L: 18 – 22 in (46 – 56 cm). Maximum carry weight: 40 lb (18 kg). – Body: 210D Honeycomb Cryptorip HD Nylon & 210D High Tenacity Nylon. – Base: 630D High Density Nylon / 420D High Density Nylon. – Harness: dual-density Lifespan EVA foam. – Chasis: perimeter spring steel frame with anti-barreling cross stay system. – Lining: 135D high-density embossed polyester. The Zulu 55 pack is lightweight but not ultra-light, so I have decided to show it side by side with one top-notch but heavier pack from Deuter and one ultra-light pack from Osprey. You realize from the table that the Zulu 55 is somewhere in between with its very good volume/weight ratio which is 33 liters/kg. As you see, Osprey Exos 58 pack is much lighter but it has far fewer features and it is not a match for this Zulu pack. The Futura Vario is heavier but it has extra two precious zippered side pockets which I love to have in my pack. Nevertheless, I rate Zulu 55 higher, and this comes as a surprise even to me, the weight plays a crucial role in this rating. So in the summary of this Gregory Zulu 55 pack review, I would stress that this pack has a great balance of features and weight, hence my high rating. 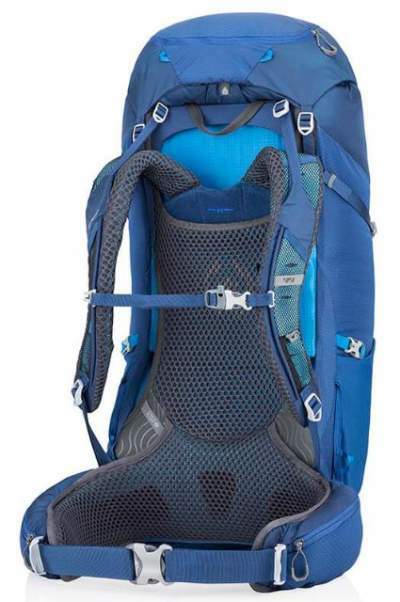 It is suitable for multi-day hiking and backpacking tours, and if you need a ventilated backpack this is the closest to perfection that you can find. I have included it in my list with best backpacking packs for men. If you need more option in the same size range, please visit my page with packs up to 55 liters, and also the page with packs 56 liters plus. Note that this is not a sponsored text and I am not related to the manufacturer. Please use the comment box below in the case of questions. Have a nice day.